Game-based learning: more than child’s play! When education or training feels dull, we are not being engaged and motivated. In other words, we’re not really learning. “Learning” doesn’t mean rote memorization – it means acquiring the skills and thought processes needed to respond appropriately under pressure, in a variety of situations. There’s a lot I love about being a teacher. Teaching is one of those rare professions that keeps your brain young, allowing you to continue your own journey as a student and a lifelong learner. We as educators speak often about creating lifelong learners, but if we aren’t buying into it ourselves, then our students don’t stand a chance. After four years of working as a math teacher I was frustrated and decided that there must be better ways of learning math. The same issues popped up in almost every classroom I knew about and it seemed prevalent in other countries too. I realized that the problem wasn’t with the students but with the form of instruction. Children have more neurons actively creating new connections than adults do, so they can do things like learn to play tennis or memorize the multiplication tables or learn to play video games or fix a computer more easily than we can. Teaching has not changed in 200 years. Classroom education still involves a teacher, a blackboard and children behind their desks with books, paper, and pencils. Khan Academy came up with the idea of video recording the teacher and made it available on the web. This gave us the opportunity to see how a great teacher would teach in the old fashioned way. Last year some people came up with the idea of MOOC (Massive Open Online Course) with which schools could offer their courses for free to anyone. But MOOC is still teaching as it was done 200 years ago. The only difference is that you are more likely to get a better professor – and that you do not have to go to any classroom. But can the teaching be done more efficiently? Simply by letting the students learn by themselves? 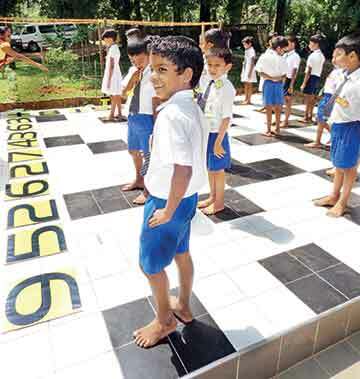 This is called game-based learning, which is a way to change the educational paradigm. Teaching can only get better if we spend more time on creating good interactive resources and lay special emphasis on pedagogy. Teachers need to see how ideas connect across fields and to everyday life. This kind of understanding provides a foundation for pedagogical content knowledge that enables teachers to make ideas accessible to others. As pedagogical devices, games are extremely useful. They can enliven teaching topics and are especially effective for dealing with problem solving and key concepts. Research shows that “games have a special role in building students’ self-confidence” and “they can reduce the gap between quicker and slower learners”. The beauty about games is that you can move on in your own speed. You get immediate feedback. You are supposed to fail and to learn from your errors. And the award for making it is that you get even tougher challenges to solve. Students learn through experiences, through trial and error. Games offer a safety environment to test and learn through mistakes so the information becomes meaningful when students understand its use. Games can be your best ally to turn the information into meaningful content. You do not have to throw away your traditional methods and use only game-based learning. Instead try to merge traditional methods with the new ones to make your classes more engaging so students get a positive experience of the learning process. Khan Academy has taken teaching a long way, making learning available whenever and wherever you are. The next step is to make learning available whenever and wherever you are with the best possible resources. But it is even more important to create a process where the resources are tested by learners instead and of having one lesson prepared by a teacher in one hour based on a book. We are talking about creating resources that deliver a learning experience that is well-designed and tested. Almost every child spends countless hours mastering a game, whether it is a team sport, a board game, or a computer game – and now they have opportunities to apply their love of games to learning math, science, and other educational content in fun and engaging ways. The key for those of us working in education is to find ways to translate this enthusiasm for games – and willingness to spend hours playing – into school subjects. Teachers must create these resources. This is the future of education. That is exactly what we are working to do with teachers and game designers. Together with some game developers and cognitive scientists we managed to rewrite the whole mathematical language and come up with the DragonBox. DragonBox is not about gamification, not about games, not about tablets, not about apps, not about technology. DragonBox is about learner centricity and the aim of teachers in the digital era of learning should be to create the best pedagogical resources. DragonBox is such a student centric tool where kids down to four years old are able to solve Algebraic equations they are not supposed to solve before they are 15. This tool can be incorporated in higher levels of education in schools or even home schooling. In simple words, it teaches children Algebra secretly. We all know Algebra is sometimes considered to be the most difficult of all mathematical disciplines to teach. Increasingly, we find that game-based learning can do more than engage students – it can help teachers and parents customize learning and track students’ progress. With gaming technology, teachers can log in and get immediate results on how their students perform. They can see where individual students are struggling and personalize their lessons, or discover where the whole class needs help. The author is CEO and creator of multi award winning game Dragonbox of We Want to Know in Norway. He is teacher educator and holds a M.Sc. in IT and mathematics, a certified financial analyst, certified math and economics high school teacher. He can be reached at jb@wewanttoknow.com.